Based on the number of daily visitors to its web site, IACCM now ranks as the world’s 215th largest country! 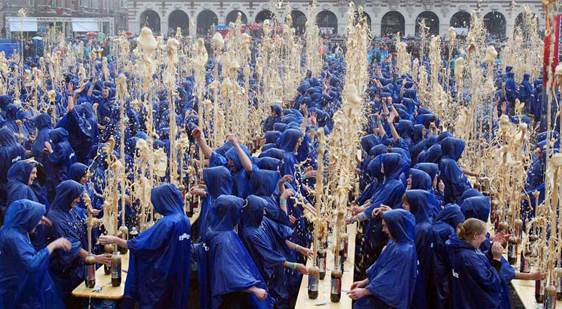 A world record for the biggest Coke-Mentos explosion belongs to 1,500 students of Leuven, Belgium. Students, each wearing a blue poncho, added Mentos mints to a bottle of Diet Coke for a simultaneous explosion. iaccm.com has more than 1500 daily visitors. If it would be possible to bring all of the iaccm.com visitors to one place for a meetup, it would be a good idea to get some Mentos and Coke and break this record. That is the analysis undertaken by Sharenator, a traffic assessment tool. It also reveals the hunger for knowledge and networking in India, one of the most prolific users of IACCM services – second only to the United States. Of course, if we look at numbers of members (rather than daily web site visits), IACCM is already in 195th place in the league of countries, fast catching up with Palau. By year end, we hope to be overtaking San Marino. One thing is for sure – IACCM beats every country on the planet when it comes to the rate of population growth, adding around 2% each month!